Blue Leopard Print Midi Shirt Dress is rated 3.7 out of 5 by 14. 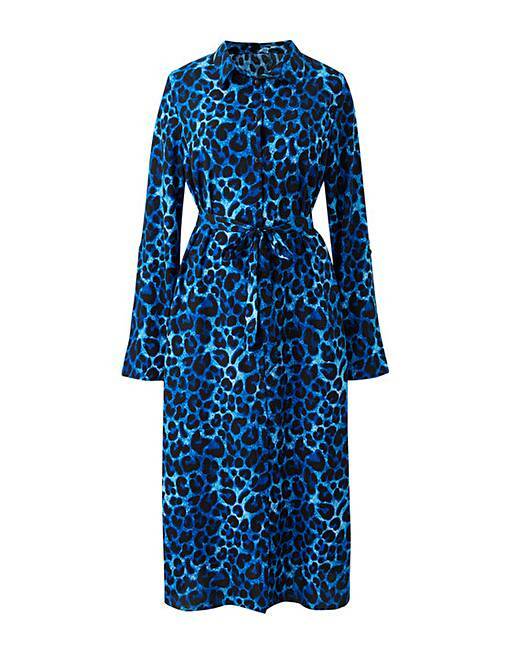 This midi shirt dress comes in an on-trend blue leopard print for the new season. Featuring long sleeves that can be turned up to a three quarter length with the button fastening and a tie waist, this midi shirt dress can be teamed with black accessories to create an ideal am to pm look. Rated 5 out of 5 by Janey from Fab shirt dress! Lovely colour and fabric, easy to wear and doesn't crease. Rated 2 out of 5 by Sharone24 from Very drab I felt like i was wearing a dressing gown with very thin material, it is also very long ( i am 5.6) definately not for me, I returned it. Rated 4 out of 5 by Justysszczurek from something what i was looking for. i was thinking that material is more thick. But i like this dress anyway. Rated 2 out of 5 by Auntie1 from Love the print This didn't suit me as I'm short and curvy, it looked shapeless on me unfortunately as I did like it.